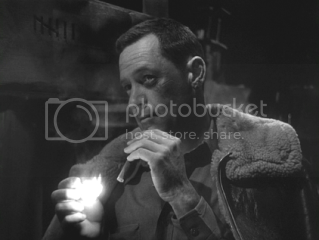 Stalag 17 is interesting in its smallness. Wilder opens the film with a narrator noting how there isn’t any films about POWs, and then proceeds to make a much exaggerated, happy-go-lucky version of one. I mean, this film certainly doesn’t make for an accurate portrayal of POW life, so I question why Wilder opens Stalag with such a contradictory statement. As I noted, the film is small, both in its subject’s appeal and its physical space – characters are confined in small barracks. It certainly helps in achieving the mood of the film – soldiers are trapped and trying to escape. The film’s plotting is fairly typical, though effective because Wilder knows how to present his story both concisely and with linguistic energy. Sefton (William Holden) is accused of being a rat – he sort of represents how capitalism works in the barracks, as he manages to trade and gamble his way to getting whatever he wants. But when information is leaked to German soldiers, costing American lives, the barracks immediately assume that Sefton is trading information for the material. Of course, that’s not the case, as we then move through the film trying to pick up all the bits of information as to who is the mole. Attempting to find the mole is interesting, though there are certain narrative bumps along the way that hinder the film’s momentum. Most of it involves slapstick comedy, which feels incredibly forced. I hesitate calling it out of place, given that it’s Wilder, but I really didn’t think it blended well with the focus of the film. There are hints of melancholy throughout the roughhousing, such as when Robert Strauss reminisces about a poster of a woman, only to see her in a drunken stupor (she is actually his friend in the barrack who is dressed as a woman). But Strauss’ antics wear thin and grow repetitive. I suppose, in theory, I liked the film. It’s kind of like Altman’s M*A*S*H before-the-fact. But Altman made something like this obsolete. Or maybe I just like Altman more. Either way, the ideas in Stalag 17 were there, but had 20 minutes been shaved off the runtime, I think I would’ve liked it more.